August 09, 2013 features / You Might Also Like? During the previous installments of this column, I viewed Netflix’s recommendation engine merely as a computer algorithm that draws clear-cut connections between projects. Now, however, I fear I’ve underestimated it. Perhaps it’s not just a simple piece of technology, but rather a complicated form of artificial intelligence capable of doing deep research and making sophisticated associations that might elude lesser intellects. Perhaps the Netflix recommendation robot wasn’t providing easy answers, so much as challenging me to find connections myself. When I started with Lee Daniels’ The Butler, Netflix’s suggestion that I might also like Magic Mike looked simple enough: Matthew McConaughey starred in Daniels’ hilarious melodrama The Paperboy the same year he starred in Magic Mike. But the recommendation engine suggested I might also like the 2002 comedy Paper Soldiers, and that connection was much less clear. It doesn’t share any major cast or crew members with The Butler, nor are they thematically similar. The connection, I suspect, boiled down to a fascinating figure named Damon “Dame” Dash, who bridges the worlds of uptown and downtown, the arthouse and the streets. Dash produced Shadowboxer, the first of Daniels’ unintentionally hilarious melodramas, and co-directed and produced Paper Soldiers, in addition to contributing a self-deprecating cameo as himself. When Damon “Dame” Dash dies, his obituary will inevitably describe him as Jay-Z’s one-time business partner (unless their recent low-key reconciliation blossoms into more), but that doesn’t do justice to the strange role Dash has played in pop culture. When he burst onto the scene alongside Jay-Z in the mid-1990s, clutching a bottle of Cristal in both hands, Dash represented a weird new archetype: the businessman as superstar. Puff Daddy at least rationalized his hunger for the spotlight by pretending to be a rapper; Dash needed no such excuse to be front and center in Jay-Z’s videos throughout the 1990s. In the good years, Dash and Jay-Z were complementary opposites. In most partnerships, the artist provides the flash, but with Dash and Jay-Z, it was the other way around. Dash was the untethered, rampaging id to Jay-Z’s cold, calculating ego. Dash became famous through force of will and stubborn persistence, but also because he made great copy. The press loved Dash nearly as much as he loved himself—or at least, it was morbidly fascinated by him. Dash is a personality above all else, a whirlwind of gab, attitude, ideas, and energy. He’s also an inveterate dilettante whose far-flung résumé reflects his diverse interests and inability to concentrate on anything. Music and fashion dazzled Dash’s short attention span before he turned his attention to the world of film, launching Roc-A-Fella’s film branch. Four years, many bad investments (including a line of Keds sneakers with fruit-flavored soles), and lots of bad press later, Dash cut a much different figure. A 2010 New York Observer article about what it refers to as his “hippie art collective” DD172 sneeringly titled “The Wannabe Warhol” depicts Dash as a crackpot would-be cultural revolutionary presiding over a strange performance space/art incubator/happening-facilitator, and discoursing pretentiously about what he describes as “Wack World,” a sinister realm filled with businessmen coldly obsessed with finding ways to make money off upscale urban products. The Dash of the past was now the cultural enemy of the Dash of 2010. Dash’s words in the Observer article would seem disingenuous even if his former artist Beanie Sigel hadn’t accused Dash of ripping him off for $11 million. This lends a distinct irony to the scene in Paper Soldiers where Dash, playing himself, bumps into the crew of protagonist Kevin Hart, and explains that the music industry isn’t what it’s cracked up to be, so he’s picking up some extra cash the illegal way, to pay for his artist’s studio time. In a neat, ironic reversal of the usual dynamic, Paper Soldiers depicts an executive robbing for his artist, instead of straight-up robbing his artists. Paper Soldiers is the product of Dash circa 2002, when he was still trying to get his cinematic hustle on. At the time, the movie fit snugly into the disreputable subgenre of hip-hop hood movies, low-budget direct-to-video genre films, particularly crime dramas, that aspired to nothing more than attracting the attention of video-store consumers with boxes promising lurid sensationalism and appearances by famous rappers. In B-movie tradition, these films often promised far more than they delivered. Rappers whose appearances barely amounted to cameos are often depicted as leads. Paper Soldiers is particularly egregious in this respect: Jay-Z is first-billed above the title for a role that literally consists of a single shot of him in the studio, smiling serenely as his music bumps. In this comic look at some would-be urban gangstas, hip-hoppers Beanie Sigel, Memphis Bleek and Jay-Z are a crew of thieves who take it upon themselves to mentor inept young upstart Shawn (Kevin Hart)—trouble is, the crew itself isn't exactly a model of finesse. When his partners in crime wind up in jail, Shawn tries to go gangsta, solo-style. Michael Rapaport and Stacey Dash co-star. There are a couple of things wrong with that description. 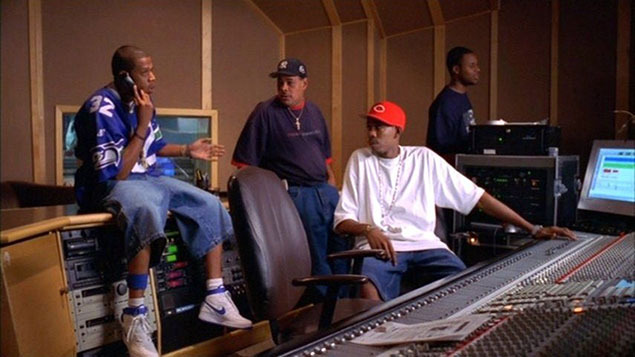 Jay-Z doesn’t play a thief: He plays himself, enjoying his own genius in the studio for 20 seconds. He doesn’t have any scenes with Memphis Bleek or Beanie Sigel, nor does he mentor anyone. The summary is accurate, however, in that Michael Rapaport does co-star, though even that’s a bit of a stretch, as his turn is more like a cameo. For other sorts of films, such subterfuge would seem loathsome. Here, it’s accepted, expected, even demanded. As a rapsploitation consumer in the late 1990s/early 2000s, I would feel shortchanged if a DVD box didn’t lie to me. It was all part of the hustle: Make the most of whatever you have, even if that’s Jay-Z agreeing to appear on camera in a non-speaking role for less than a minute. To paraphrase the title of a Jay-Z single from the years when Dash and Jay-Z were inseparable in the public imagination, you can’t knock the film’s hustle. Rapsploitation joints tend to be laughable, full of inane tough-guy posturing, leering T&A, and gratuitous violence. Paper Soldiers sets itself apart by being intentionally laughable, inviting audiences to see through its characters’ tough-guy posturing and manufactured personas. That makes a huge difference. Gangsta rap traffics in fantasies of invulnerability and power, but Paper Soldiers’ characters are defined by their vulnerability and powerlessness. 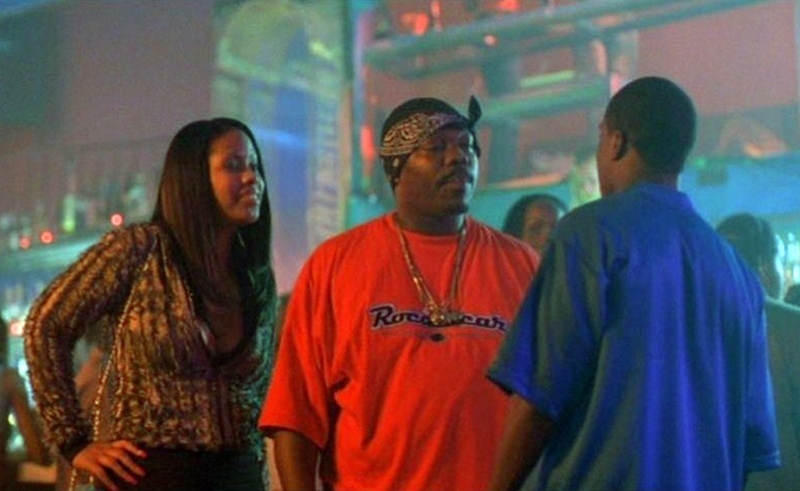 Early in the film, Shawn and Burtie try to get down with the crew of “Big T” (the late stand-up comedian Patrice O’Neal, who enters and exits the film within the same hectic minute), only to see Big T get gunned down in front of them by a competing hustler played by Cam’Ron (another former Roc-A-Fella artist). Shawn and Burtie respond to having a gun stuck in their face with uncontrollable weeping and panicked prayers. Here and elsewhere in the film, Hart delivers a lead performance winningly devoid of bravado or vanity, playing a scared, overwhelmed man-child. He’s freaked-out prey in a harsh urban jungle. Hip-hop comedies often suffer because the rappers in them don’t want to look foolish. Comedians generally don’t suffer the same affliction, and Paper Soldiers benefits tremendously from having a funny, likeable, quick actor-comedian at its center, rather than a rapper concerned with protecting his image. Dash has a reputation for spotting talent: He played a big role in the careers of Jay-Z and Kanye West, and he deserves credit for ferreting out a talented future superstar in Hart, who carries the film on his narrow shoulders and minute frame. The film’s wobbly plot involves Shawn and his sad little would-be crew falling deeper and deeper into the home-burglary game after he’s unable to provide for his family with the meager earnings from his main gig working at a beeper store. Shawn acquires an unlikely partner when much-feared neighborhood bully Stu (Beanie Sigel) decides he wants in on Shawn’s extra-legal action. Onscreen, as on record, Sigel has remarkable presence. With his hulking physique and intimidating aura, he looks like he could crush Hart like a Coke can. The two have an appealingly offbeat chemistry rooted partially in their visual contrast. There’s an unexpectedly resonant moment deep in the film when Shawn and Stu rob the home of a beloved rapper. Stu excitedly tears the rapper’s gold records off the wall in a fit of greed, only to realize that they aren’t gold at all, but worthless spray-painted vinyl records. Disgusted, he smashes the plaques in a sequence that bluntly speaks volumes about the empty promise and distracting glitter of the record industry. This isn’t the film’s only commentary on the cruelty of the music industry: Over the course of his misadventures in thievery, Shawn encounters the man of the hour himself, Dash, robbing a house to pay for studio time for his Roc-A-Fella artists. We then see Jay-Z in the studio and learn that Shawn took advantage of him being there by robbing his home. As Shawn admiringly reports, however, Jay-Z managed to flip the situation to his advantage by dramatically over-reporting the value of the stolen goods to his insurance company, so he can make a tidy profit in the exchange. Shawn quips that Jay-Z is such a financial genius that he even manages to make money off being robbed. Dash has never been implicated in any burglaries, but he has been accused of all other manner of financial chicanery by prominent members of Paper Soldiers’ cast, though they may have been acting on behalf of sinister agents of Wack World. Like the hapless dreamers of Paper Soldiers, Dash is now hurting for money. These days, when Dash’s name appears in the press, it’s generally within the context of tax problems, foreclosures, and other financial woes. I have faith in Dash, however. It would be foolish, after all, to underestimate a man who has both conquered the world (with a little help from Jay-Z) and knows the oft-overlooked value of a good butler. So maybe this all connects back to Lee Daniels’ new film after all.